Systematics offers the very latest in records management technology with Radio Frequency Identification (RFID) to electronically track records. RFID technology is not new technology, rather it has been used for decades by different organizations to track inventory and shipments. However, initially, the cost of implementing RFID technology was outside the reach of most organizations. This is the reason, why very few people knew about the technology. RFID is advancing day-by-day and SYSTEMATICS works with organizations throughout all markets to help reduce the costs which ultimately leads to accountability and seamless implementation of of RFID for document and asset tracking. RFID uses radio frequency tags and readers for transmission and reception of the radio signals. The RFID tags are either active or passive in design. The active tags are tags that have an in-built battery in them while the passive tags are simple, with no internal battery. This brief video shows the benefits of implementing RFID to track and manage files. Watch the video to see it in action. 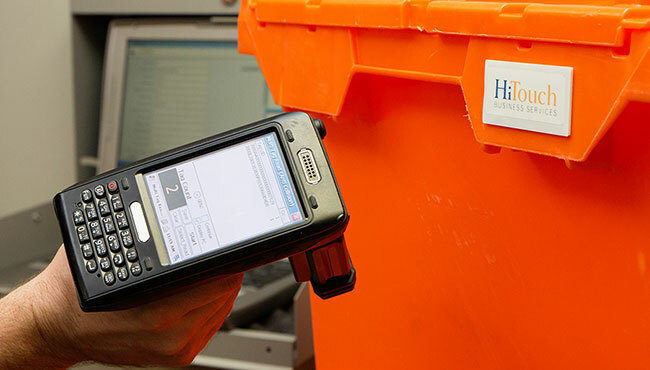 You will see how the RFID hand held device can find a lost file in a filing system without manually having to search through individual files and wasting a lot of employee time finding lost files. This is a productivity tool as well as a corporate compliance and asset management tool. To learn more call 800-229-8393 today. RFID tags can store more information than barcode labels and allow users to lock in certain critical data, while still permitting update capability on more flexible information. This can allow multiple barcodes to be replaced with one RFID tag. Also with RFID tags, multiple tags can be processed simultaneously, adding significant efficiency improvement in high-volume environments. Tell me more about RFID & Barcode Tracking. Call 800-229-8393 to get in touch with SYSTEMATICS now!